I finished Rose's Sunday sweater the other week. She wore it a few times before I even got around to blocking it! It looks so much better after being blocked though and the stitches look so much smoother. I knit the 4/5 year size thinking it would be pretty baggy on her and last for a couple years but it fits pretty much perfectly. Rose is just so tall! People seem generally shocked when I tell them she's not 3 until January, she looks so much older already.. I wouldn't usually go for such a girly pink colour when knitting but this Cascade yarn is from the 'heather' range and is quite multi-tonal, there are little flecks of light and dark pinks in there. I like the prettiness of it though and it looks lovely with a lot of her dresses. When I was back in Bridport last month I bought two skeins of this yarn by Araucania Yarns. It's called Puelo and is double knit weight. The yarn is 100% llama and is very soft, initially I was planning on knitting myself a hat and then like usual, I changed my mind. I decided to knit Arthur a jumper, from a pattern that I'd had saved on my Ravelry favourites list for ages. It's called Livingston and is the most lovely jumper. The yarn knit up like a dream and is so soft on Arthur's skin. I really enjoyed knitting the jumper but the pattern was so much more complicated than what I prefer... you had to start knitting from the bottom up, then knit the sleeves separately on DPN's, then attach them all together on the circular needle, then there were instructions to break the yarn on several occasions while knitting the top part of the jumper. All in all there were a Lot of ends to sew in at the end! You can't really tell from these photographs but the little wooden buttons have tree's engraved on them. Very sweet, I bought them from Cloth Kits a while ago. I'd actually only bought three for some reason a couple months back, then when I realised that I needed one more I popped back into the shop and after a search I found the very last button they had in the shop. It was like it was meant to be! I've also knitted a pair of Edwin Creams and happily managed to get one pair out of a 50g ball of Rowan pure wool 4ply. I just had to make the ribbing section a little shorter and be careful not to waste any yarn. I think the next time I knit these I will knit with 2.75mm needles though as these are slightly loose and because I'm always pushing the buggy, they tend to roll up a little which is a bit annoying. The perfect excuse to knit another pair! I've been sewing quite a few of these drawstring lined pretty bags for me to store my knitting projects in. I'm attempting to get myself more organised! They are rather addictive to sew because they are so simple though and I've even sewn one for Rose's spare nursery clothes. She starts going to nursery 3 afternoon's a week the week after next and I am really looking forward to have a bit of one on one time with Arthur, she is so ready to go though and will love it. Rose and Arthur seem to be growing at an alarming rate these day's... Arthur will be 11 months on Saturday and Rose will be 3 at the end of January. I was looking back on some of my photo's on my laptop from over the last 3/4 years and I can't quite believe how much things have changed! I mean... he's already able to stand, all by himself!! A few minutes of 'Me' time! ...and amazingly, this is what was happening at the same time! It doesn't happen very often that they are sleeping simultaneously in the day. A treat for Mummy to have a few minutes of peace and quiet! I managed to knit a few rows of Rose's 'Sunday Sweater'... I LOVE this pattern by Ginny from Small Things, it's written So clearly and it's such a pretty pattern. I already think I may be knitting this in another colour! It's the first time I've knit with Cascade 220 and so far... I'm impressed! This pale pink colour from the Heathers range looks beautiful when knitted up and it's lovely and soft, not to mention excellent value! 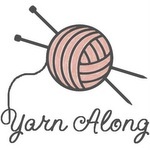 This week I am joining in with the Yarn Along with Ginny over at Small Things. We've been spending a lot of time outdoors over the last week or so, the heatwave is still in full-flow and it's pretty warm around here! It's lovely to have such nice weather but boy is it it hot! I used to be able to lie out in the sun reading my book for Hours on end before I had Rose and Arthur but now... well, when you're rushing about sorting the kids out all of the time, it's easy to just end up feeling a bit hot and bothered! I'm knitting a Milo vest for my friends baby that is due in September. Originally I started using the same yarn to knit a vest for Arthur but it was turning out to be only Just big enough for him... and it's a bit warm at the moment to be wearing knitted vests! I just finished it off yesterday, so I will block it and take a couple of photo's for you to see. Arthur is now on the move! He's finally and 7.5 months figured out how to roll over! He kept getting his arm stuck underneath him for a couple of day's but is now rolling back and forth, then also wriggling around in a sort of circle. It's like he just wanted to take it easy for that little bit longer before getting mobile! We managed to take some photo's of Rose wearing her new cardigan this afternoon. I had the cardigan blocking on the floor just outside of the back door and she kept going to check if it was dry yet or not, she'd been desperate to have it on to wear ever since she saw me pinning it out early this morning. In the end she actually only wore in for 10 minutes before saying "Mummy, too hot!" I did warn her it was too warm today to be wearing a cardigan but she wouldn't listen.. she is a very stubborn little girl! The pattern is available to buy here on Ravelry and the yarn I used was Rooster almerino dk in colour 213 (cherry). I bought the yarn when I was back in Dorset from Bridport Yarn which is a gorgeous shop. I originally planned to knit a jumper for Arthur with the yarn but then I realised the colour was much more suited to Rose and I had other idea's for items I wanted to knit for him anyway. It was Amazing to knit with, glided over my needles and is so super soft now it's knitted up. I've really got my knitting mojo back now... I can't believe that there were Months when I was pregnant with Arthur that I didn't knit a single stitch! All of that time that I wasted where I could have gotten lovely things made.. ahh well, I must have felt Really tired if it meant that I couldn't face my knitting needles! I've been hurrying along on a couple of my current knitting WIP's, as I desperately want to join in with Sarah's knitalong over at craftsfromthecwtch but I cannot have So many things on the go. I find I actually start to feel stressed over the amount of unfinished projects I have half-knitted, which is silly really as it's supposed to just be a very enjoyable hobby! I've chosen and printed out the pattern for the Cloud Illusions shawl which looks so beautiful... hopefully I can manage all of that lace! The yarn that I've chosen to use is a 100g skein from The Yarn Gallery which I hope will look good with that pattern. I finished Rose's cardigan this morning before 7am, as all of the little people in the house decided to be awake nice and early! It was good to get it washed and and blocked out at that time though because it meant it has dried very quickly in the sunshine today! I will take some photo's and put them in a post soon for you to see. I'm still trying hard with the healthy eating... it's been hard on a couple of days when we have been visiting family and things. It's always easier for me to eat the right things when I'm at home and have the option of something healthy.